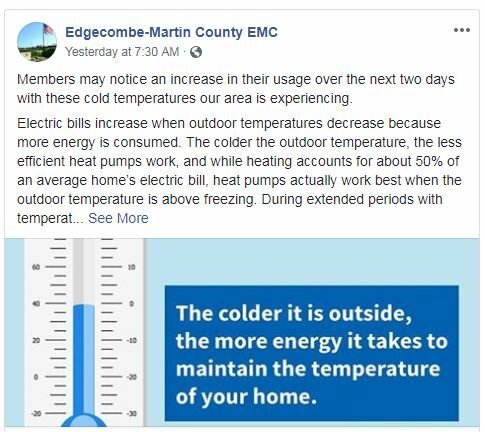 With frigid temperatures in the forecast from the mountains to the coast, electric co-ops across the state are providing their members with resources and information to help them manage their energy use during cold weather. 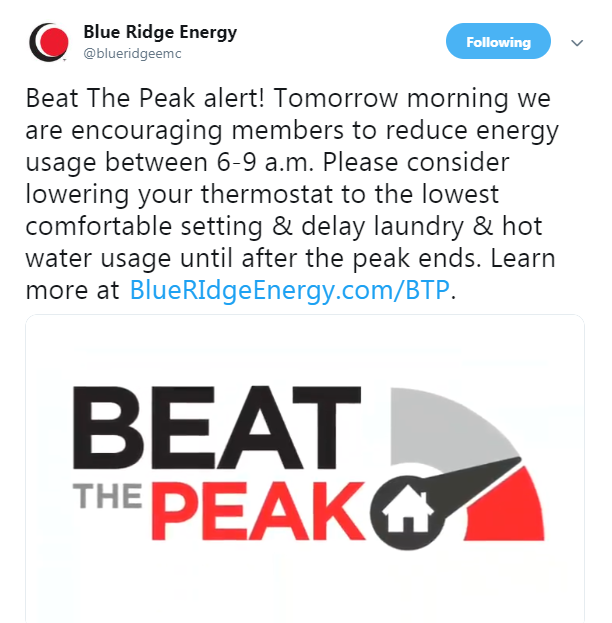 Blue Ridge Energy, based in Lenoir, issued a Beat the Peak alert on Monday, Jan. 21, encouraging members to reduce their energy use between 6 and 9 a.m. Through this voluntary program, members are notified of an upcoming peak usage period—a few critical hours when people are using the most electricity, all at the same time (typically only a few of the hottest weekday summer afternoons or coldest winter mornings). Participants then take simple steps to reduce their energy consumption during the peak period, like turning off unnecessary lights, adjusting their thermostat a few degrees, and delaying laundry or the use of hot water. Click image to view post. 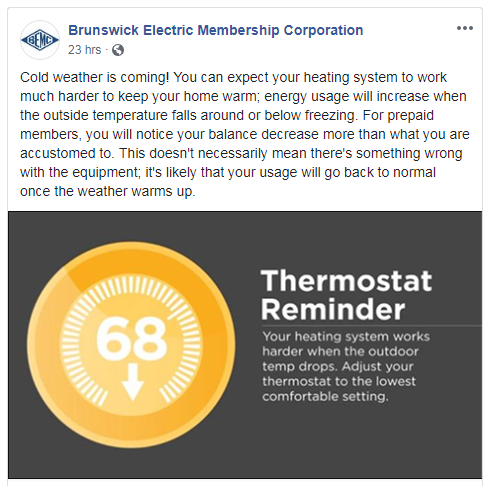 Other co-ops, such as Brunswick Electric based in Supply and Edgecombe-Martin County EMC based in Tarboro offered information about why more electricity is required for home heating during extremely cold weather and advice about how to combat extreme outdoor temperatures. Click image to view full post. Energy Monitoring. Track your energy use from your computer or mobile device to keep heating and energy-related costs in check. High-Use Alerts. Sign up for text or email alerts that let you know when your energy use reaches a certain level. Energy Efficiency Rebates/Loans. If you need a new heat pump or other home appliance, many cooperatives offer rebates/loans to help offset their cost. You’ll also save money year-round through the increased energy efficiency these products offer. Home Energy Audits. Kick off the year with a home energy audit through your electric cooperative. Energy experts can give you guidance on ways to make your home more energy and cost efficient. Reach out to your local electric cooperative to be connected with tools and resources that help you understand and manage your energy use and make more informed energy decisions. Find additional energy tips for saving on heating costs in the Energy & Innovation section of our website.